To say that the holiday season is a little stressful is an understatement. With food prep, travel, shopping and family, it’s easy to overexert ourselves during the last few weeks of the year. Does your phone or tablet seem to be a source of strain? Well, it’s actually a tool you can use to decompress and make life more manageable within a matter of minutes. 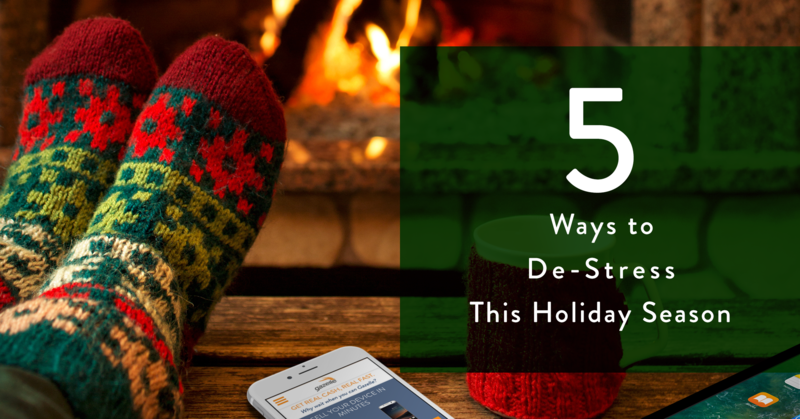 We’ve narrowed down five simple solutions to de-stress this holiday season with personal tech. Download those apps (yes, they actually work). Apps aren’t just for launching birds into poorly built structures or touching up your Instagram pics. They’re also super convenient tools when it comes to the art of decompressing. Stress and anxiety relief apps range from the meditative calm (Calm app) to simple distracting fun (Bubble Game). Meditation apps can help to cool down from a long day. They include features such as timed breaks with soothing sounds or yoga apps with step-by-step stretches. For those of you dealing with finals and deadlines, coloring apps like Pigment can provide the satisfaction of producing a beautiful piece of art on a short work break. If you’re a subscriber to Spotify, Apple Music, etc. and aren’t utilizing curated playlists, it’s time you do some browsing. There are dozens of playlists and podcasts available to help you ease into a calm state of mind. There’s a little something for every taste in music, from classical music to trance and chill ambient. Simply browse in the mood section or search “calm” or “soothing”. You’re certain to find something to settle your mind and satisfy your ears. You’ve probably heard of adding some feng shui to your living environment, but did you know you can do the same favor for your phone, tablet or laptop? Try changing your background or wallpaper to a soothing image or color. Updating your ringer to something more soothing may ease the senses as well. It may also help to clear old or duplicate photos and files and get your tech organized for the New Year. Replenish your bank account by trading in your old tech. If you’re in the habit of gift-giving for the holiday season, it never hurts to put some extra funds back into your bank account. That’s why it’s the perfect time to get organized for the upcoming year by cleaning out your unused tech and trading it in to Gazelle. We take a wide range of phones, tablets, MacBooks and Mac Computers so that your gadgets can enjoy a second life while you enjoy some money put back into your wallet. Check out our trade-in process and see how much that iPhone or iPad laying in your drawer is worth by clicking here. Start the New Year off right with certified tech from Gazelle. Don’t stress on having the hottest and greatest when it comes to technology. Gazelle makes it easy to own the latest for less. Whether it’s a late model iPhone or loaded MacBook, we’ve got what you need at a portion of the retail price tag. Our inventory is home to several Apple, Samsung and now Google products. Check out our selection to start your new year on the right foot and leave your tech stress back in 2017.